Weight restrictions for the Tandem Skydive – Females 13st, Males 15st. BMI will be taken into account so please let us know if are over these limits, you may still be able to jump. You’re balanced at the edge of an open doorway of an aircraft flying at approx 10,000 feet, the drone of the engine and the wind whistling in your ears with only the outline of the distant ground visible below. Now imagine leaning forward out of that doorway and letting go – falling forward into the beckoning blue sky, diving down through the air as you freefall at over 120mph! Then suddenly you feel a pull against your body and the roar of freefall fades away as you swiftly decelerate. Now imagine the peace and quiet as the canopy opens, the steering toggles come up either side of you and you begin a tranquil parachute descent from a mile up in the air, steering back down to the centre of the drop zone below. 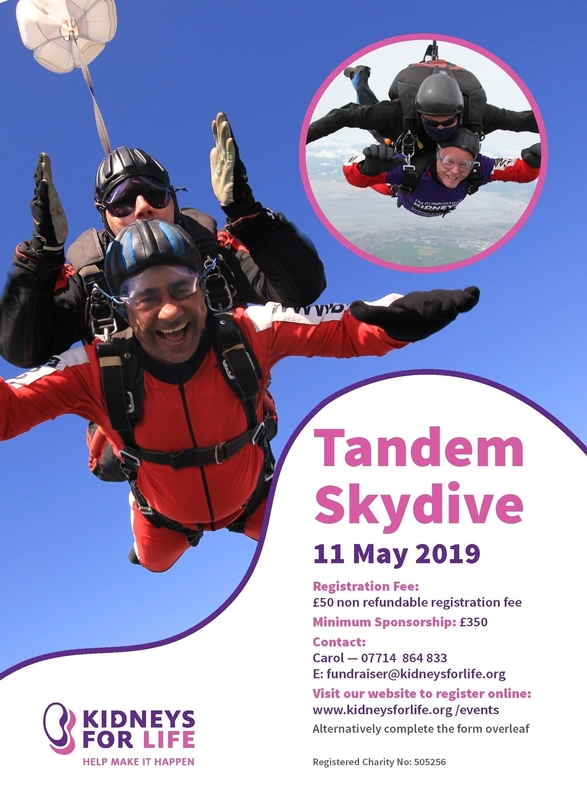 Well you can stop imagining because it’s real and you can experience it for yourself with a Tandem Skydive for Kidneys for Life at Cockerham Airfield near Lancaster. Securely attached to your specialist British Parachute Association instructor and his tandem parachute equipment you’ll freefall together from approx 10,000 feet at 120mph. As you’re just the passenger no experience is needed and all training is given. Freefall down to 5,000ft at 120mph! Certificate to prove you have completed a 2-mile high tandem skydive!